The toboggan Stablein is about 5 km. Walking time to Stableinalm about 90 minutes. Toboggan rental: ski rentalshop Sportalm and Venter Kaufhäusl in the mountaineering village of Vent or directly above in the panorama restaurant Stablein. Starting point: by foot or with the double chairlift Wildspitze. The starting point is in Vent 1,900 m at the exit Rofen P9. From there we walk 500 m along the ski slope . After about 500 m the path goes on the right. On the way there are always cozy seating areas that are perfectly positioned, offering a wonderful view of the mountain village located in the valley basin. After about 1 hour the path leads us into the valley and after half an hour we reach the beautiful Stableinalm at 2.356 m , The magnificent sun terrace offers an incredible view of the Rofental and the mighty Ötztal mountains. At the restaurant we enjoy a perfect lunch. After we have drunk our coffee on the panoramic terrace and have a last look at the magnificent panorama, we borrow a toboggan and curves into the valley. 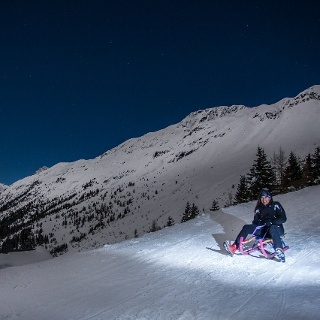 The toboggan Stablein is well prepared and for young and old a real experience. Especially recommended for families. 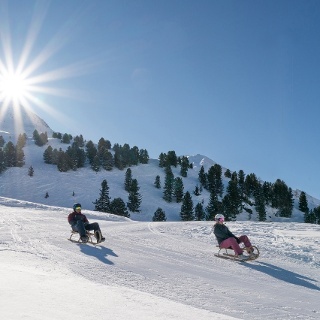 For those who want to experience the winter, in Vent is a 5 km long, well-groomed natural toboggan run available. 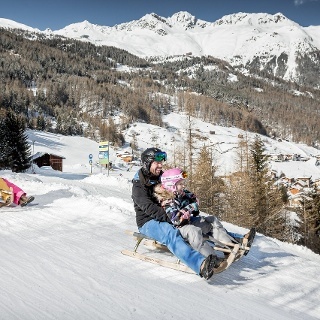 This fun toboggan ride including a stop at the Stableinalm is great fun for all ages. a ride up and down with the new 6-seater chairlift Wildes Mannle on 2.646. At the mountain station, we have a tremendous view of the Rofental and the surrounding Ötztal mountains. please note that the toboggan Stablein can be closed due to its exposed camps for safety reasons. Please inquire about the conditions before leaving. Suitable equipment such as breathable and weather-adapted outdoor clothing, ankle-high hiking boots, wind, rain and sun protection, cap, and gloves, are required for all walks and tours. The transport of a first aid package, a mobile phone, a bottle with enough water and possibly a Hiking map is recommended. At the panorama restaurant Stableinalm or in Vent's cafes and restaurants. In the mountaineering village Vent at the exit P9, turn right, about 500 m over the ski slope. After approx. 500 m turn right onto the toboggan run.